Sciency Thoughts: Isthminia panamensis: A South American ‘River Dolphin’ from the Late Miocene of Panama. Isthminia panamensis: A South American ‘River Dolphin’ from the Late Miocene of Panama. There are four species of River Dolphins known today; Inia geoffrensis and Pontoporia blainvillei from South America, Platanista gangetica from South Asia and the probably extinct Lipotes vexillifer from China (Lipotes vexillifer, the Yangtze River Dolphin, is considered Critically Endangered under the terms of the International Union for the Conservation of Nature's Red List of Threatened Species, as there were less than 50 adult individuals surviving when the species was last assessed in 2003, all living within a few hundred kilometers of one-another on a single river). These were formerly thought to comprise a single group, but are now thought to represent three distinct lineages that separately invaded freshwater environments from the sea. The fossil record of the Asian River Dolphins is poor, but the South American River Dolphins, Inioidea, have a fairly good fossil record, with freshwater fossils known from a number of sites in South America, and older marine specimens from South America, North America and Europe. 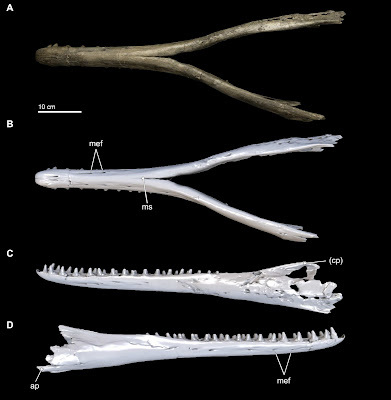 In a paper published in the journal Peer J on 1 September 2015, Nicholas Pyenson of the Department of Paleobiology at the National Museum of Natural History and the Departments of Mammalogy and Paleontology at the Burke Museum of Natural History and Culture, Jorge Vélez-Juarbe of the Department of Mammalogy at the Natural History Museum of Los Angeles County and the Florida Museum of Natural History at the University of Florida, Carolina Gutstein of the Department of Paleobiology at the National Museum of Natural History and the Comisión de Patrimonio Natural at the Consejo de Monumentos Nacionales, Holly Little, also of the Department of Paleobiology at the National Museum of Natural History, and Dioselina Vigil and Aaron O’Dea of the Smithsonian Tropical Research Institute, describe a new species of South American ‘River Dolphin’ from the Late Miocene Chagres Formation on the Caribbean coast of Panama. The new species is named Isthminia panamensis, where ‘Isthminia’ means ‘isthmus-Inia’ a reference to the similarity between the fossil, which was found on the Isthmus of Panama, and the living Inia geoffrensis and ‘panamensis’ means ‘from Panama’. It is described from an almost complete skull, a complete set of mandibles (lower jaws) and an incomplete right scapula and two carpals. The specimen is estimated to be between 5.8 and 6.1 million years old. 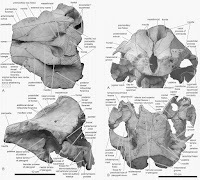 Skull in dorsal, anterior, and posterior views. Dorsal views of the skull of Isthminia panamensis from (A) photographs and (B) orthogonal digital three-dimensional polygon model prepared from CT data, with lighting and colour modifications using the Smithsonian X 3D browser. (C) Anterior and (D) posterior views of the skull of Isthminia panamensis from orthogonal digital three-dimensional polygon model prepared from CT data. Anatomical Abbreviations: adif, anterior dorsal infraorbital foramen; alis, alisphenoid; fr, frontal; gf, glenoid fossa of squamosal; ju, jugal; la, lacrimal; max, maxilla; mc, maxillary crest; me, mesethmoid; na, nasal; nar, bony narial opening or naris; nuc, nuchal crest; pa, parietal; pdif, posterior dorsal infraorbital foramen; pmax, premaxilla; popf, postorbital process of the frontal; socc, supraoccipital; sopf, supraorbital process of frontal; smf, suprameatal fossa; sq, squamosal; zpsq, zygomatic process of squamosal. Pyenson et al. (2015). Isthminia panamensis is estimated to have been about 285 cm long in life, making it large for a Inioid, though not the largest species known. It has an extremely long snout compared to the skull, though this is typical for an Inioid, being one of the more obvious distinguishing features of the group. It had 15 teeth on each side of its upper jaw and 18 teeth on each side of its lower jaw; most of these teeth are straight and lack wear facets, though the canines and premolars curve backwards slightly, and some of these do show wear. Mandibles in ventral and lateral views. 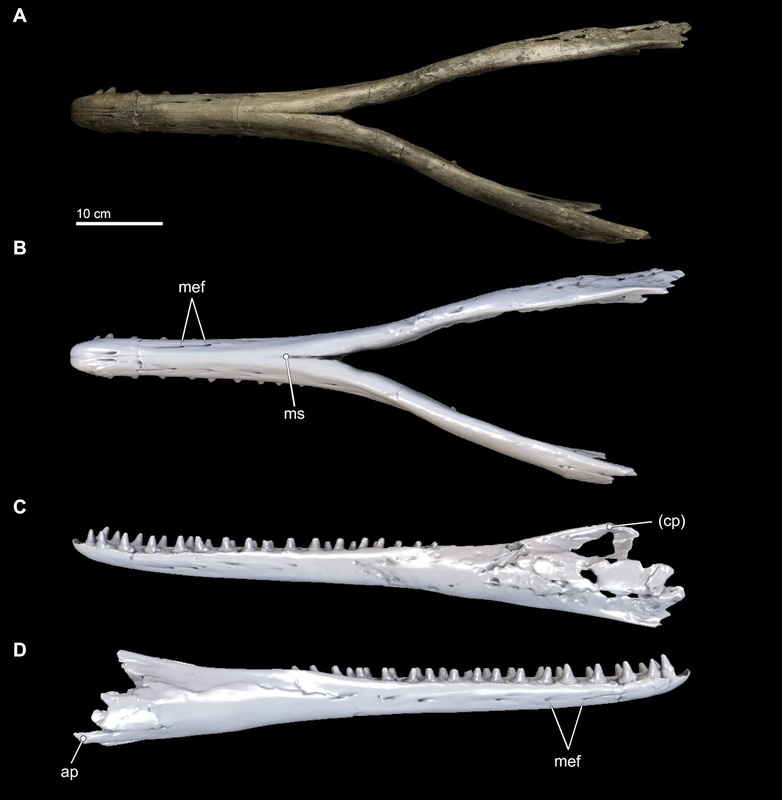 Ventral views of the mandibles of Isthminia panamensis from (A) photographs and (B) orthogonal digital three-dimensional polygon model prepared from CT data, with lighting and colour modifications using the Smithsonian X 3D browser. (C) Left lateral and (D) right lateral views of the mandibles of Isthminia panamensis from orthogonal digital three-dimensional polygon model prepared from CT data. Anatomical Abbreviations: ap, angular process of mandible; cp, coronoid process of mandible; mef, mental foramen or foramina; ms, mandibular symphysis. Pyenson et al. (2015). Isthminia panamensis shows a number of morphological traits more consistent with a fully marine lifestyle than a freshwater one, and the Chagres Formation is interpreted as having been an open water marine environment not close to any estuary or riverine environment. This is interesting as, while marine Inioids are well known in the fossil record, the majority of these are thought to have lived before the group invaded freshwater environments, or at to have descended from members of this group that diverged from the true ‘River Dolphins’ before this invasion. 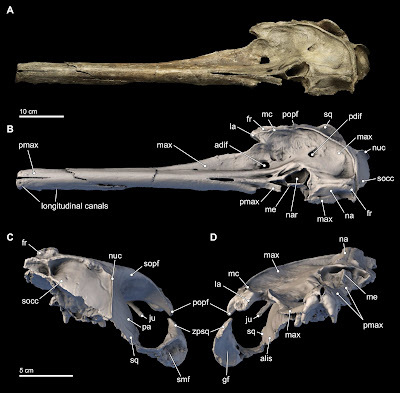 Isthminia panamensis appears to have been more closely related to the living River Dolphin Inia geoffrensis than the other South American River Dolphin species, Pontoporia blainvillei. This has implications for the history of the Inioids as a group, as it implies that either the ancestors of Inia geoffrensis and Pontoporia blainvillei invaded freshwater environments separately, or that the ancestors of Isthminia panamensis moved from a marine environment to a freshwater environment and back again. Either of which scenarios undermines the simple view of a single transition from one habitat to another by a group which gave rise to all later River Dolphins in South America, and suggests a more complex history for the group. Reconstruction of Isthminia. Life reconstruction of Isthminia panamensis, feeding on a Flatfish, which would have been abundant in the neritic zone of the late Miocene equatorial seas of Panama. Julia Molnar in Pyenson et al. (2015). A fossil Porpoise from the Early Pliocene of Antwerp Harbour. 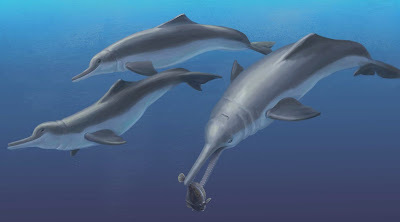 A fossil Dolphin from the Late Miocene of Hokkaido, Japan, which may be the oldest True Dolphin. 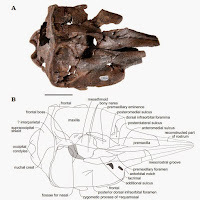 A new species of Dolphin from the Early Miocene of Peru. Magnitude 2.8 Earthquake in Rutland, England. Stick Insects of the Mascarene Islands. Asteroid 2015 RM83 passes the Earth. Asteroid 2015 PT227 passes the Earth.